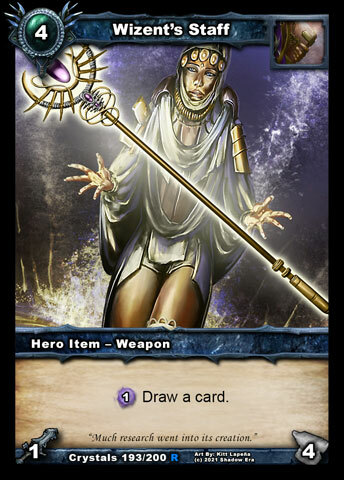 Welcome to the 8th article in our Lost Lands spoiler series! 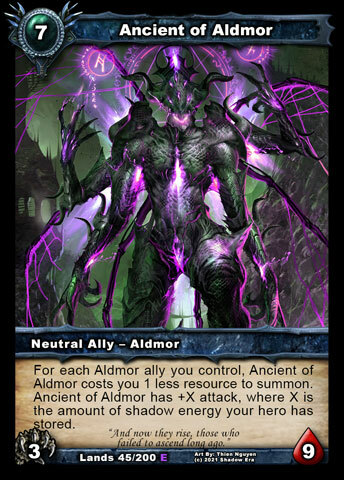 If you’ve been following the preceding articles, you’ll have heard us mention pseudo-tribal decks a few times, which refers to using allies sharing something other than alignment, like damage type. If themed decks like that are something you’re interested in building and playing, whether for flavor reasons or for a synergistic gameplay pay-off, this article is for you, since we have three new spoilers that will expand your theme deck options when Lost Lands Part 1 hits! Beyond that, each spoiler has been selected for how it adds to previous article subjects, which we'll refer back to throughout. 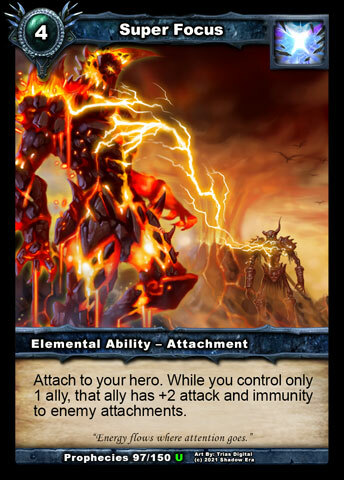 As shown by Entangled Wisp and Lightning Quarry in previous spoiler articles (here and here, respectively), we’re aiming to boost electrical damage decks in Lost Lands. We’ve also mentioned there will be some cards to give some much needed synergy to ice damage decks (to be revealed in future weeks - sorry!). 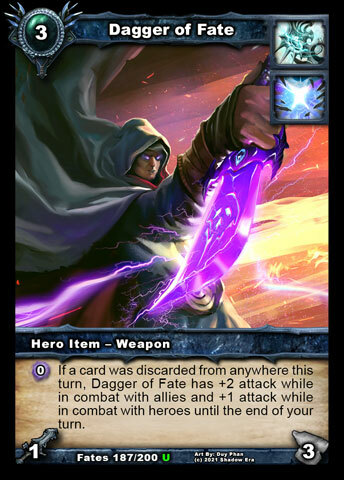 But what about the more established viable themes from Shattered Fates like fire or arcane? Let’s address one of those right now! 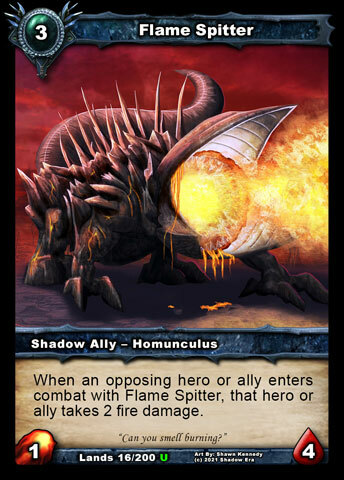 Flame Spitter fills a very important role as the third 3-cost Fire attack ally available to Shadow, and the most aggressive of the three, since the default damage done during an attack would be 3 fire damage (5 fire damage with Infernus out) and it will usually do 1 damage when defending, even if killed before it can hit back. 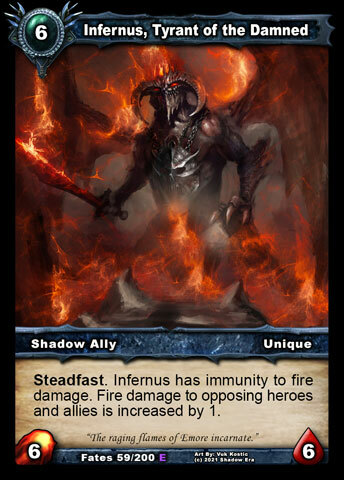 On top of that, while Grimghast and Brimstone Devourer might have trouble with cards like Ellos' Resolve or some hero armors, the enter-combat fire damage here will ensure at least some damage is done when attacking (helpful for triggering Flameforged Gauntlets or Flameborn Defiler ). 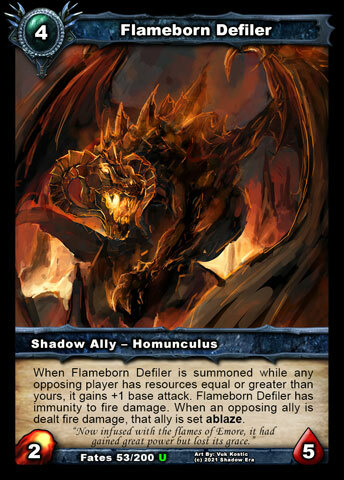 Aside from giving options when deckbuilding, having access to a total of twelve fire-theme allies at 3-cost should really help with consistency and resource curve. 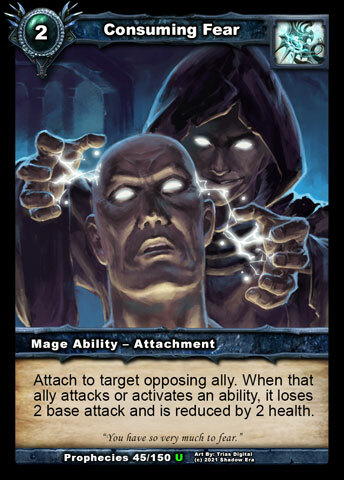 It does similar things for the Homunculus alignment, becoming the third and most aggressive 3-cost Homunculus ally available to Shadow too. Whilst ice, fire, arcane and electrical damage can be dealt as both combat damage and ability damage, there are three other types of damage that can only be dealt as combat damage: Sword, Claw and Bow. As of Shattered Fates, there is no functional difference between them, but, as hinted in last week's article, this is going to change in Lost Lands. Let's take a look at a card that's going to help make that change. 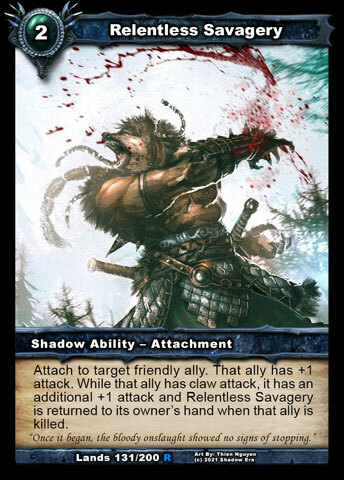 As you can see, Relentless Savagery is a card that gives its best value when attached to a Claw attack ally, offering both ongoing +2 attack for 2-cost and it returns to hand when that ally is killed. This is intentionally very good value, aiming to establish the Claw attack theme immediately. Who are the best heroes to make use of it though? 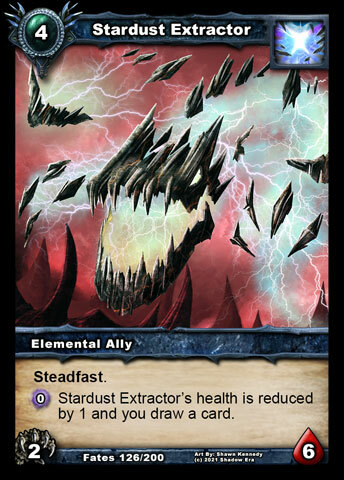 A quick look over Shadow allies with Claw attack shows a mixture of relatively underused ones and some very popular ones and then also plenty of class allies in the Elemental and Wulven class pools. Based on that, the Claw attack theme has three main ways to go. Firstly, it could be run by Shadow Warrior/Mage/Hunters using a mixture of established viable Claw attack allies and maybe a few of the lesser ones, most likely capitalising on the huge value of Relentless Savagery , as well as a few other attachments and the drawing power of Confluence of Fate . 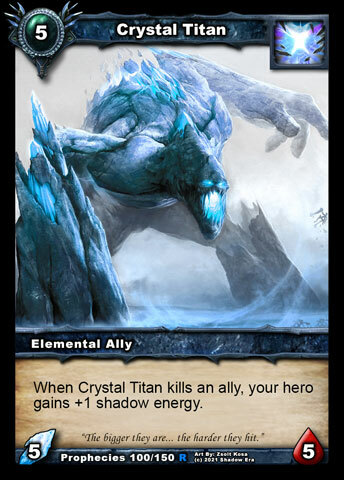 Secondly, it brings more synergy to the Elemental class allies (all but Crystal Titan have Claw attack), which could lead to Elemental ally decks with possibly some other Claw attack allies splashed in. 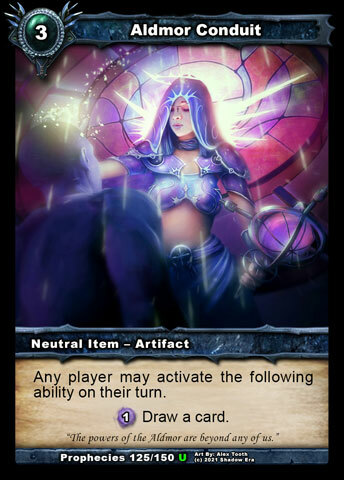 Again, a Confluence of Fate deck seems quite possible for them when cards like Exaltation, Super Focus and Life Infusion are considered too. 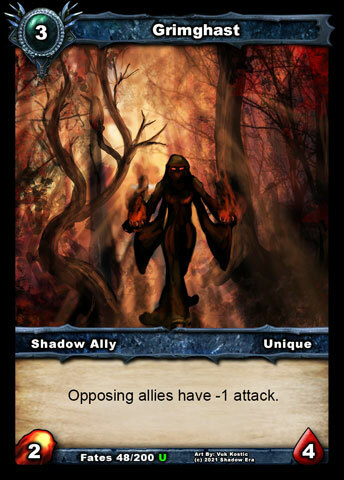 Thirdly, it boosts the Wulven alignment for all Shadow heroes, since all Wulven allies have Claw attack. 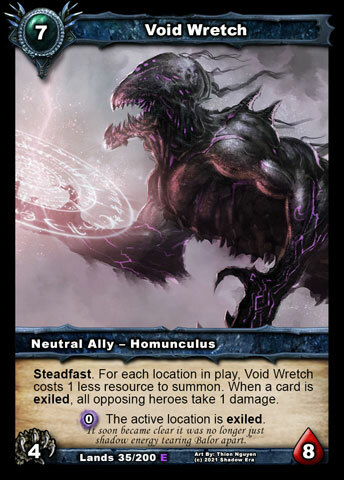 For non-Wulven heroes, this represents the third boost to the Wulven alignment decks, joining the two new Shadow Wulven alignment allies revealed some weeks ago. 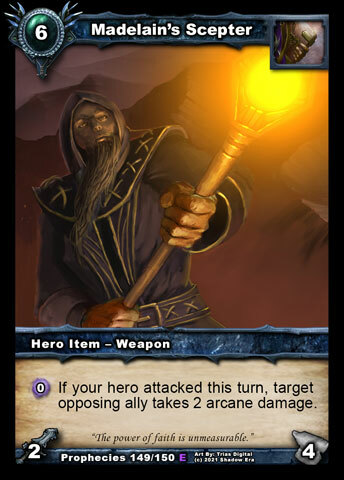 And for Wulven heroes running Wulven allies, it could prove to be an even bigger boost, if the intention is to maintain a steady flow of threatening allies. How viable do you think each will be when Lost Lands Part 1 hits? Be sure to let us know your thoughts in the comments! 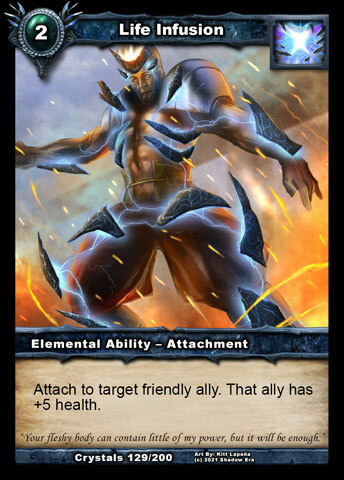 Side note: If you are wondering why this card will play on any ally and just give +1 attack without Claw attack, that's to allow for some splashing of non-Claw attack allies without increasing the odds of it being a totally dead draw and also to make it be more playable in Meltdown (and other limited formats) when you may not be able to assemble a horde of Claw attack from what packs you got. 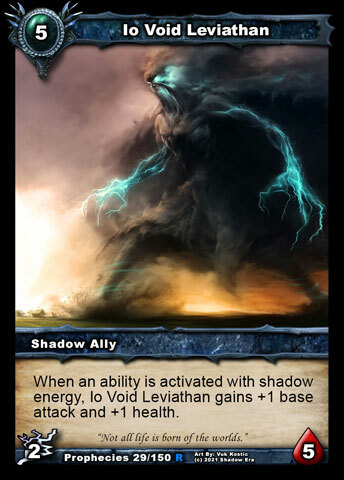 Rather than growing like Io Void Leviathan , Darklight Apprentice generates shadow energy, acting like a rebate for 1SE or higher and as a source of shadow energy flowing from using 0SE abilities! 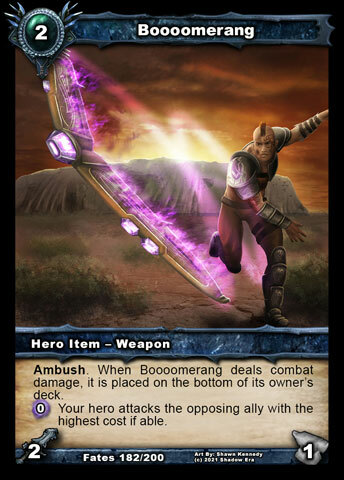 Whilst this may end up meaning Boooomerang 's 0SE ability comes back to hurt us, the hope is that this ally will be a good thing for the game, helping to establish some viable shadow energy themed decks at a very appropriate place and time in our story. Admittedly, he is not particularly tough to remove, but the passive starts being relevant as soon as he hits the board. 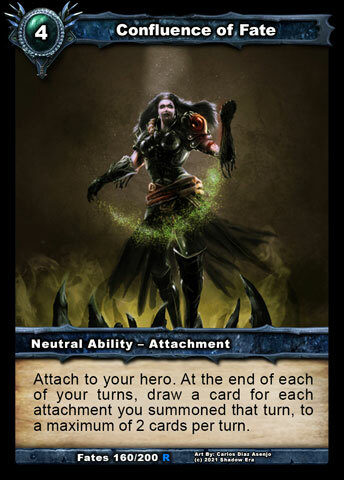 And, if you can get two or more Apprentices out, you can start increasing your shadow energy from 1SE abilities too. I’m really looking forward to seeing what people come up with, whether Aldmor alignment or not. 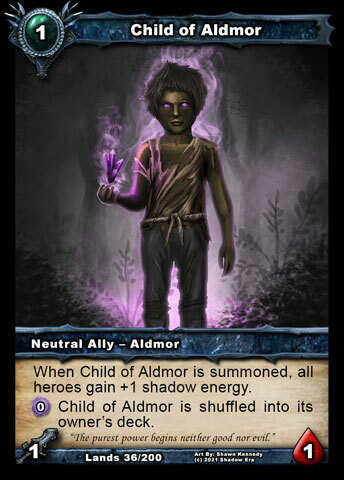 But speaking of the Aldmor alignment, based on what we have seen so far of Aldmor cards in Lost Lands to date, Apprentice has huge synergy with all of them, particularly via the SE rebate (or generation in the case of Child of Aldmor ) but also as a cost-reducer for Ancient of Aldmor and an ally to be boosted by Aldmor Conflux . 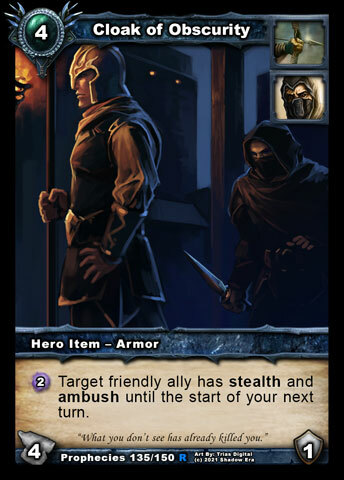 Stay tuned for further Aldmor cards being revealed over future weeks that also synergise with Darklight Apprentice! As seen with Io Void Leviathan , sometimes you can attempt to build a theme around one specific card, which might then later get boosted by others. 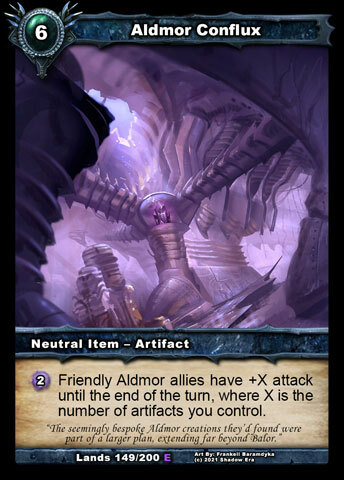 Since we're fresh out of spoilers for this week, I'd like to open it up to the community now to hear about other themes you have explored with build-around-cards or some other shared characteristics? Last edited by Gondorian; 08-21-2015 at 06:27 PM. Really cool cards yet again! A little disappointed to not see any kind of support for ice damage so far though. 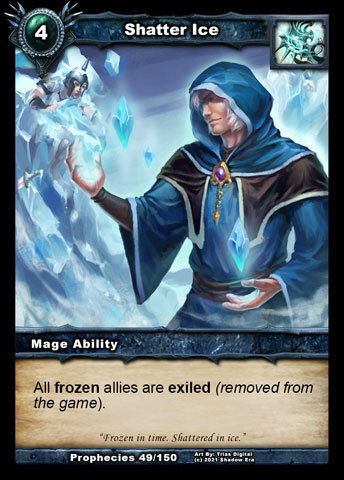 Ice is a theme I've tried and I'm sure others have tried to explore in the past, only to find that Shatter Ice is the only synergistic card. Otherwise playing full ice just slows the game down and isn't particularly fun. That's why I'm hoping to maybe see something that boosts ice damage or maybe some other interactions between ice and exile. Perhaps even an ice themed land card would be cool (pun intended)! 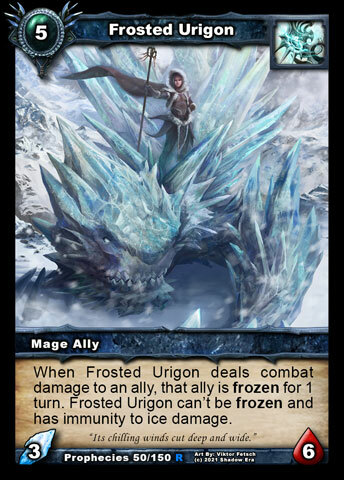 I would say more allies like Frosted Urigon that have some interaction with ice attack and frozen (not necessary just immunity to frozen) would help detour from pure stall strategy. I would gladly replace Consuming Fear or Frozen grip with allies like that. Right now there is not enough support to build ice/freeze viable deck. Also more efficient ways to proc Shatter Ice would be nice. 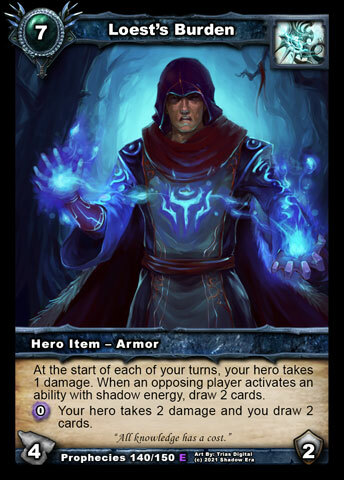 Back in the DP days I somehow ended up with four foil Cloak of Obscurity . I struggled every which way to make a viable deck around them. 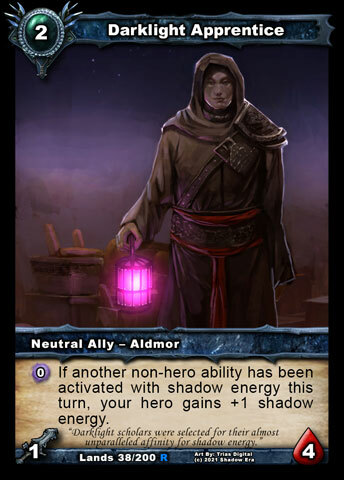 Perhaps the new Apprentice and other Aldmor cards will allow it to shine a little less dimly. It would be interesting...I think some cards will always be a bad deal. 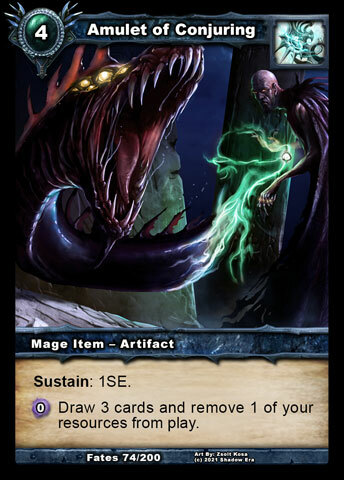 There are many cards with cheap (Wizent's Staff ) or 0SE costs right now that are already worth playing. Generating SE is huge with these. I also do a video show with TJ SamuelJ - Bob and Sam Trollin it Up! 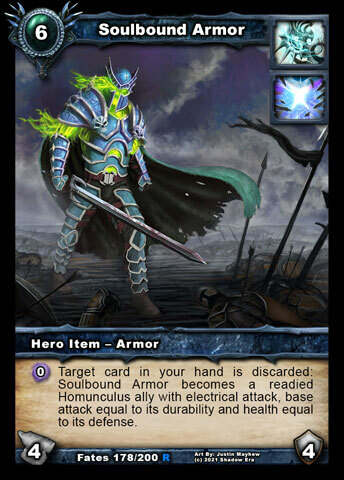 Stardust Extractor 's ability + Darklight Apprentice = card draw and +1SE. When going second, T1 Child of Aldmor + T2 Darklight + Child's ability = any 4SE ability ready to go by T2, lol. Darklight Apprentice is the scary one... So much can happen. Darklight Apprentice - is a strong one, he'll make free draw for Wizent's Staff and Aldmor Conduit . Stardust extractor plus this guy could be a serious trouble. They added something for boomerang therebin! They added something for boomerang therebin! Woot woot woot mlg m8 yay! Creator of boomerang combo deck. Likes playing lots of card games. I had a really awful signature in the past so i changed it.